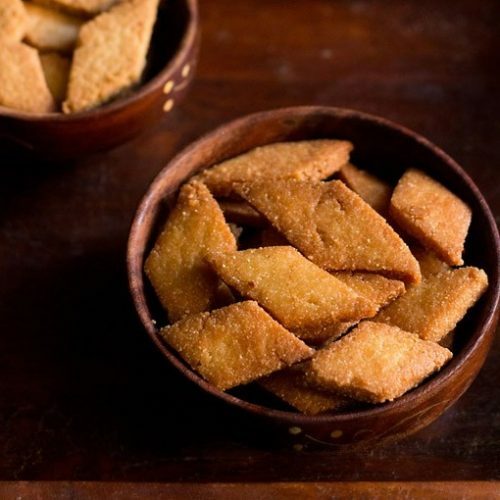 sweet shankarpali recipe - crisp, flaky, melt in the mouth fried and baked biscuits. shankarpali is a popular festive snack from maharashtra. powder the sugar in a dry grinder and keep aside. first sieve the flour with salt. then sieve the powdered sugar. add the melted ghee or warm oil to the flour-semolina-sugar mixture. mix the fat into the flour mixture and make a breadcrumb like consistency. when gathered together, the whole mixture should be able to hold itself together. warm the milk. then add each tbsp of the warm milk in intervals and knead to a firm tight dough. if the dough looks dry, then add 1/2 or 1 tsp milk and knead. keep aside covered for 20-30 mins. heat oil for deep frying in a kadai or pan. divide the dough into two equal parts. roll one part into a disc 6-7 inches in diameter. cut diamond slices from the rolled dough. gently drop 6-8 of these slices into the kadai or pan. you can fry more if you have a bigger kadai or pan. fry shankarpali till golden. drain fried shankarpali on kitchen paper napkins. fry the rest of the shankarpali in batches. also roll the other piece of the dough in a similar way and make diamond shaped slices. fry these slices too in batches. when cooled, store the shankarpali in an air-tight jar. place the diamond slices on to a baking tray or pan. bake shankarpali for 20-25 mins or till light golden. remove and cool the baked shankarpali on a wire rack. once cooled, store the baked shankarpali in an air-tight jar. you can add more sugar if required. 2 tbsp of oil or ghee is enough for the quantity of flour and sooji/rava mentioned in this recipe if you plan to deep fry the shankarpali. if you add 3 tbsp of oil or ghee than there are chances of the shankarpali breaking in the oil while frying. however 3 tbsp of ghee or oil works well and gives the shankarpali a good texture if you bake them.